Brazilian President Dilma Rousseff has offered her condolences and said the nation was "shocked" after a woman died when dragged by a police car along one of Rio de Janeiro's busiest roads. Mother-of-four Claudia da Silva Ferreira, 38, had been hurt in a shoot-out in the shanty-town where she lived. Policemen threw her into their patrol car's boot, which opened by accident when it drove off. Relatives said Ms Ferreira had been "treated like a criminal". She was dragged for more than 300 metres (1,000ft) before the car stopped at a red light. Two policemen then got out of the car, put Ms Ferreira back in the boot and drove to a nearby hospital, where she died. Footage of the incident, which happened on Sunday morning in the Madureira neighbourhood, was shown on Brazilian television. "The death of Claudia has shocked the nation. Claudia da Silva Ferreira had four children, was married and used to wake up in the early hours of the morning to go to work in a Rio hospital," wrote Ms Rousseff in her Twitter account. Three policemen have been arrested, accused of acting inhumanely and ignoring calls from residents to stop the vehicle. Relatives said that Ms Ferreira was treated with brutality probably because police suspected she was involved with the local drug gangs. "They thought she was a criminal and that is why they took her away. It wasn't to save her life," her daughter, Tais Lima, told O Globo newspaper. Image caption Ms Rousseff said her thoughts were with the family of Claudia Ferreira "in this time of sadness and pain"
"They grabbed my mother by the legs and dumped her in the boot like an animal. They didn't even bother to check if the boot was properly closed. That is not the attitude of someone who is trying to help," she added. The governor of Rio de Janeiro state, Sergio Cabral, described the attitude of the policemen as "repulsive". "They acted inhumanely. The least that should happen to them is being expelled from the police force," said Mr Cabral. 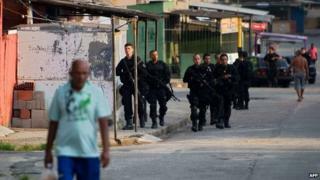 In a statement, the Rio de Janeiro police command said that policemen "exchanged fire with criminals during an operation at the Morro da Congonha community and found a woman who had been injured". "She was taken to the Carlos Chagas hospital, but did not survive," the note read.